"Being a beacon of hope for lesser people is a lonely business," concludes the narrator of this comedy by Noah Baumbach, whose cultural elitism tends to make his films indigestible no matter how heavily he satirizes it. 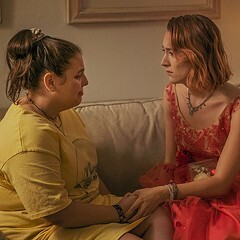 The subject of the quotation is Brooke (Greta Gerwig, who cowrote the script), a mean-spirited, well-read Trendy Wendy in Manhattan; the speaker is Tracy (Lola Kirke), a misfit college freshman who's about to become Brooke's stepsister and whose massive girl crush on the older woman begins to diminish as she develops her own sense of snotty superiority. Along with two college nerds, who are mercilessly twitted by the director, Brooke and Tracy embark on a road trip so that Brooke can sweet-talk an old flame into bankrolling her plans for a boho restaurant where cool people can have authentic experiences. Various deceptions and double-crosses ensue, the dialogue paced so fast in an effort to pump up the comedy that it would exhaust Howard Hawks.